Olympic Gold Medalist, sports analyst and author Scott Hamilton was joined by other World & National Champion Skaters for a benefit event to support Scott Hamilton CARES Foundation. These top athletes performed to live music provided by some of the industry’s top artists. Last year with Sheryl Crow and Jewel was good but Sunday they almost melted the ice when the second year of An Evening with Scott Hamilton & Friends returned to the Bridgestone Arena in Nashville, Tennessee on November 19, 2017. The fabulous Sheryl Crow returned as second year musical host. Sheryl Crow was back in her dual role as performer and musical hostess. The star-studded evening featured GRAMMY Award winner Darius Rucker, legendary guitarist and songwriter Steve Cropper, singer, songwriter and actor Charles Esten (“Nashville”), lead singer of GRAMMY- nominated and American Music Award-wining band Mercy Me Bart Millard, 2017 ACM and GRAMMY nominee Cassadee Pope along with GRAMMY-nominated artist and Opry inductee Chris Young. Scott Hamilton plus special guest and fellow cancer survivor Peggy Fleming presented some of the biggest names in figure skating including Olympic, World and National champions Katia Gordeeva (2x Olympic Gold Medalist), Meryl Davis (Olympic Gold Medalist and “Dancing with the Stars” winner), Kurt Browning (4x World Champion), Jeffrey Buttle (Olympic Bronze Medalist), Kimmie Meissner (World Champion), Jeremy Abbott (4x US National Champion and Olympic team Bronze Medalist), Michael Weiss (3x US National Champion), Alissa Czisny (2x US National Champion), Ryan Bradley (US National Champion), Steven Cousins (8x British National Champion), Sinead Kerr-Marshall & John Kerr (7x British National Champions), Kiira Korpi (5x Finnish National Champions), and Kimberly Navarro & Brent Bommentre (US National Bronze Medalists). The music and skating were both elevated in 2017. 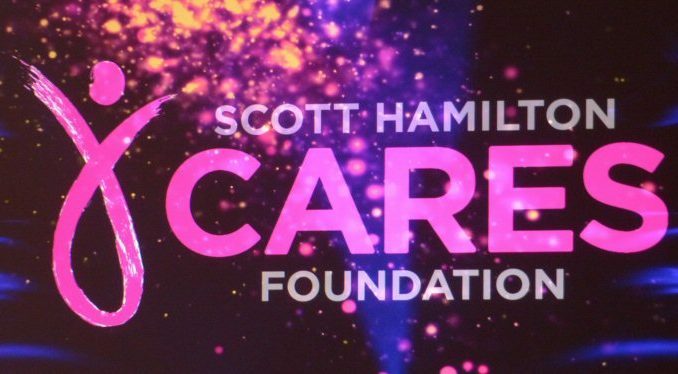 This family friendly, fun event raised money for Scott Hamilton CARES Foundation which is dedicated to changing the future of cancer by funding advanced, innovative research that treats the cancer while sparing the patient. A number of the participants such as Sheryl Crow have personally battled this insidious disease so it is a cause close to their hearts. Fans were treated to an engaging and entertaining combination of music paired with sports while supporting this worthwhile organization. Other celebrities were in the house, too. We spotted Mike Wolfe of American Pickers escorting his clan to their seats. Mike’s store Antique Archaeology was one of many local businesses who sponsored An Evening with Scott Hamilton & Friends in 2017. Scott came out to warm applause as he welcomed us to his house reminding us that we would be seeing skaters from around the world and that this evening was a “celebration of life”. 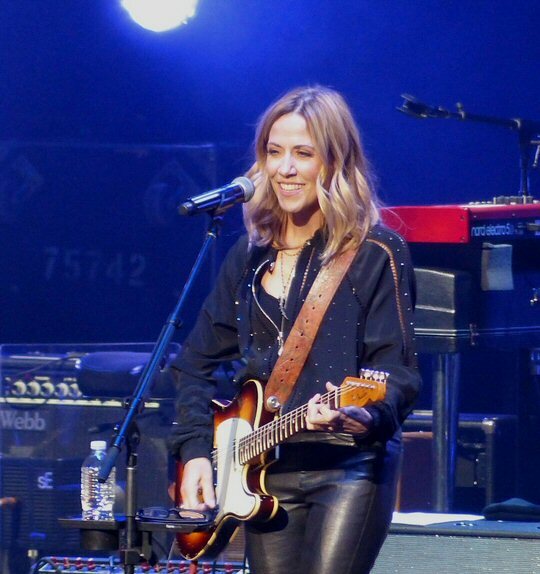 Sheryl Crow along with a capable crew of musicians kicked things off with an up-tempo “Best of Times” as the cast of athletes took to the ice with perhaps an added feeling of freedom as tonight was not a competition. Jeffrey Buttle moved to the muse of Darius Rucker with a combination of dance and some of the technical tricks of his challenging trade. Cassadee Pope with Charles Esten worked well together as more amazing skaters had fun demonstrating their fancy foot work. Pope also sang with Chris Young on “Think of You”. As they performed skater Sinead Kerr-Marshall in a reversal of roles lifted up her partner John Kerr during their dazzling ice display. 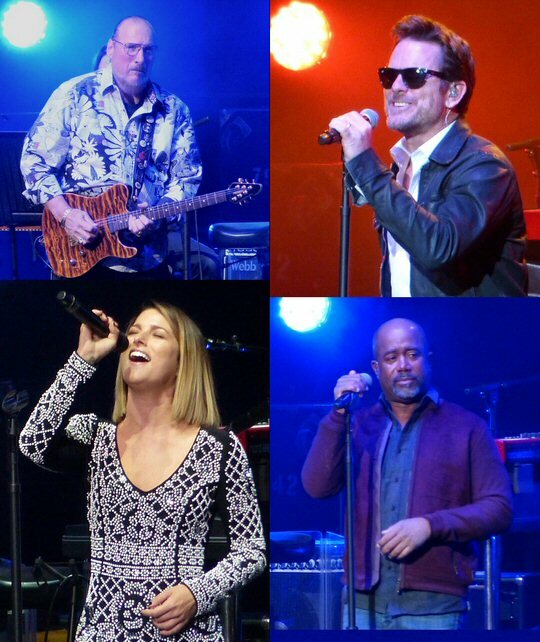 The stars on ice included Steve Cropper, Charles Esten, Darius Rucker and Cassadee Pope. The legendary Steve Cropper was joined by Bart Millard. Together they masterfully handled “In The Midnight Hour” as skater Kimmie Meissner added flair to their version of the classic co-written by Cropper. Later, Steve with Darius did justice to the timeless “Dock of the Bay” with Katia Gordeeva gliding over the ice in support. Charles Esten performed with Cropper on a solid version of “Soul Man.” The two closing numbers featured all the artists and athletes for “I Shall Believe” and “Hold On (I’m Coming)” to end An Evening with Scott Hamilton & Friends on a celebratory note. The Bridgestone Arena in the heart of downtown Nashville is home ice for the Predators. It also hosts a wide array of sporting and musical events such as Scott Hamilton & Friends. Upcoming events at the venue include The Great Xcape Tour, Casting Crowns, Janet Jackson and Garth Brooks. Scott Hamilton & Friends 2017 at the Bridgestone Arena in Nashville.